Vermiculite is ideal for the germination of seeds, because it's aeration properties combined with it's water holding capacity make it a very suitable medium for direct contact with the seeds. When vermiculite is used alone, without compost, seedlings should be fed with a week fertilizer solution when the first true seeds appear. Large seeds can be mixed with Vermiculite in a small polythene bag closed at the neck, and kept in a warm place until the seeds just start to germinate. Then plant them singly in small pots or trays of potting compost. Vermiculite can also be applied to the outdoor seed bed where it will give improved emergence and less risk of capping. Vermiculite in potting compost gives a very light open compost, holding more water and facilitating re-wetting, thereby lengthening the time between watering. Vermiculite also has excellent ion exchange properties which absorb excess nutrients and release them slowly to the plants via the finest root hairs. A 50/50 mix of vermiculite and sphagnum moss peat is widely used for greenhouse pot plants and hanging baskets, while a 25/75 mix is generally suitable for for bedding plants, nursery stock, etc. 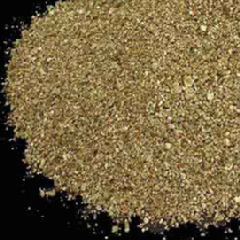 To improve an existing compost add 20-25% by volume of Vermiculite and mix thoroughly. Vermiculite/sphagnum moss peat composts stimulate root growth, giving quicker anchorage of the plant and uptake of nutrients. A 50/50 mix is generally suitable for cuttings on the open bench or under plastic covers, but a maximum of 25% is recommended under mist irrigation in Summer. Thoroughly water the vermiculite before inserting cuttings, and do not compress around the base of the cutting.